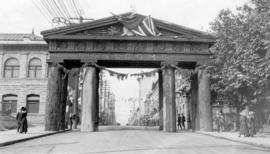 Item: CVA 90-4 - Arch at Georgia Street and Granville Street. 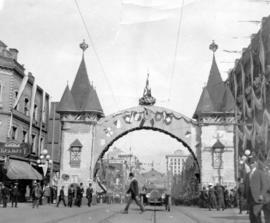 Item: CVA 90-5 - Arch at Granville Street and Dunsmuir Street. Source of title proper: Title based on the provenance of the fonds. Mary Gruchy was born in Nova Scotia. She began an association with John Davidson, the British Columbia Provincial Botanist, who started the office in 1912, at night school, and maintained a personal friendship with his family for many years. He hired her as stenographer when he opened the Provincial Botanical Office and Gardens, but she soon became the Herbarium Assistant. 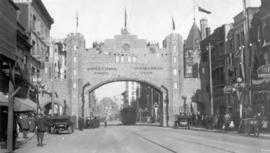 The offices were located in downtown Vancouver, then later at the Fairview Campus of the University of British Columbia, while the garden was located at Essondale. Mary Gruchy remained Mr. Davidson's Herbarium Assistant until her retirement in 1957. The fonds consists of records created, received, and collected by Mary Gruchy. Fonds includes records pertaining to the Provincial Botanical Office, such as annual reports, notes, newspaper clippings, journals, photographs, a retirement certificate, and other materials. The fonds also includes brochures from the B.C. Mountaineering Club, and a map of Mount Garibaldi. The majority of the records were donated to the Archives in 1973 by Mary Gruchy. Additional materials were donated to the Archives in 1982 and at a later date by an unknown individual. 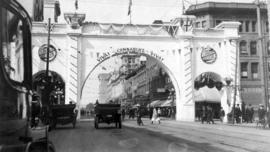 Some photographs in this file have been assigned number CVA 90-1 through 90-5. See also the John Davidson fonds (Add. MSS. 505). Folder formerly located at 514-G-07 fld 03. 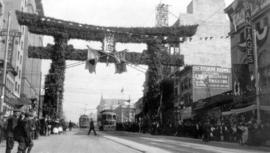 Some photographs have been separated for preservation purposes.